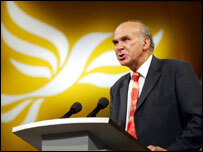 Liberal Democrats have voted against a plan to restrict the amount of money spent on the European Union. The proposal by the party leadership was branded "Eurosceptic", "cowardly" and "xenophobic" at the party's annual conference in Blackpool. Party leaders had wanted to keep spending on the EU to a maximum of 1% of GDP - the level it is at now. But this would damage spending on development plans in poorer areas, delegates heard. In an impassioned debate, MEP Chris Davies called the leadership's plans "deeply flawed". He added: "I hope I'm wrong, but I see an attempt here to move the party in a more Eurosceptic direction, and I want your help to resist it. "Every action taken by the European Union is distorted and vilified by the tabloid press. We could take the easy road. We could give in and appeal to populism. "But this is not a party of xenophobia and Little Englanders; this is a party of principle and internationalism." The party would have to avoid "the Tory road of Europhobia and division," he added. A 1% spending cap would restrict the "flexibility" of the EU to deal with environmental and development projects, he added. But Vince Cable, the Lib Dems' Treasury spokesman, said the party had "a duty to the British public" to encourage responsible spending. He added: "We are a pro-European party. We are proud of it and we need to defend it." The vote to adopt Mr Davies' amendments was carried on a show of hands - but the result was tight, leading to anger among some delegates who felt there should have been a full count. Mr Davies said making sure no more than 1% of GDP went on the EU would lead to "deep cuts" in areas such as scientific research, environmental protection and crisis response. "Just when Europe needs to be doing more than ever to fight crime and terrorism in an unstable world we would be proposing deep, deep cuts in the things that really matter," he told delegates. Party leaders argue that capping the contribution would not make a major difference to the amount the UK pays into to the EU. Vox pop: The right leader?